2017 Ecology Trainees get started! The Blackdown Hills Natural Futures project has this month welcomed its third intake of trainee ecologists. The trainees, Kitty Maurice, Lucy Jenkins and Jon Boyd recently started in their new volunteer roles having successfully applied for the three placements out of a field of strong applicants. They will be out and about in the Blackdown Hills over the summer, visiting sites and learning a wide range of wildlife survey and identification skills to help them in their future careers in ecology and conservation. 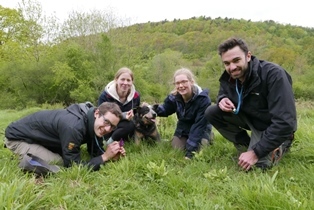 Conrad Barrowclough, Blackdown Hills Natural Futures project officer said: “It’s great to have Kitty, Lucy and Jon as part of the team this year and we are all excited about the possibility of finding some rare species through our surveys. Last year’s training scheme was a great success with all three trainees going into full time employment, and we hope to repeat that success again this year”. Click here to find out what Kitty, Lucy and Jon have been up to via their monthly blogs. Photo (L-R): Conrad Barrowclough, Kitty Maurice, Lucy Jenkins, Jon Boyd.